Who doesn't love Sundays! A morning swim, a new episode of Our Hen House, farmers' markets, hatha yoga and a long walk with my fiancé - I couldn't feel more content! Well, then there are those Sundays that also include an indulgent lunch, like the one yesterday. I haven't made crepes in ages, but yesterday the craving got the better of me and after our walk I embarked on a mission to make some crepes for lunch. These vegan and gluten-free crepes were inspired by the amazing Candle 79, a vegan restaurant I sorely wish we had here in Sydney. 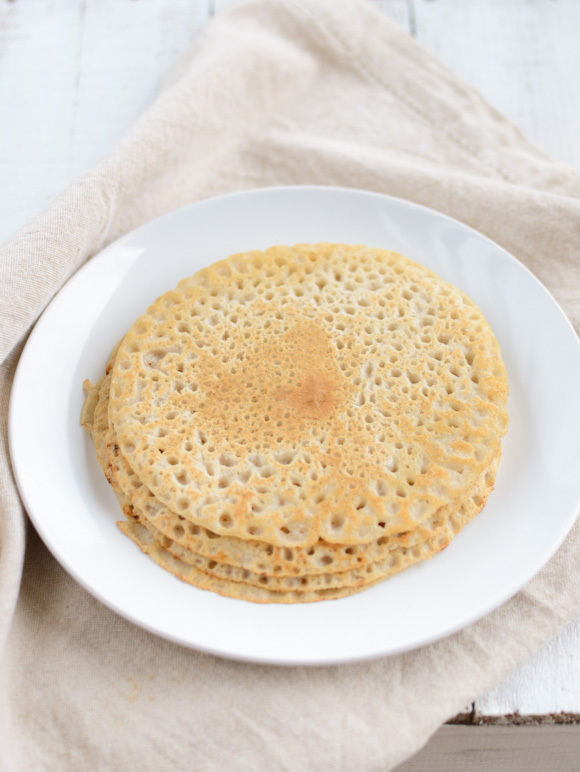 I used gluten-free sorghum flour for the crepes, but you could use chickpea or besan flour, even quinoa flour as well. Any non-dairy milk can be used in place of almond milk, which I used. Try soy, rice or quinoa, for example. We loved the filling of roasted pumpkin, but feel free to add wild mushrooms or any other seasonal vegetables you might have. A dollop of tofu mayonnaise was a perfect addition to the flavours. This was truly a fitting meal for such a lovely day! * In Sydney, sorghum flour is available at Taste Organic. Look for Bob's Red Mill brand. ** What is in Australia known as potato flour is actually potato starch. You can substitute with arrowroot powder or corn starch. *** Vitamin B12 enriched nutritional yeast is also available at Taste Organic and many other health food stores. 1. Preheat oven to 200C. Combine pumpkin, olive oil and herbs and season with salt and pepper. Toss to combine, then arrange the pumpkin on a roasting tray. Roast in a preheated oven for about 10 minutes or until tender. Remove from the oven and leave set aside. 2. Combine tofu, nutritional yeast, salt and apple cider vinegar in a blender. Blend until smooth. 3. Combine almond milk, both flours and salt in a blender and blend until smooth. 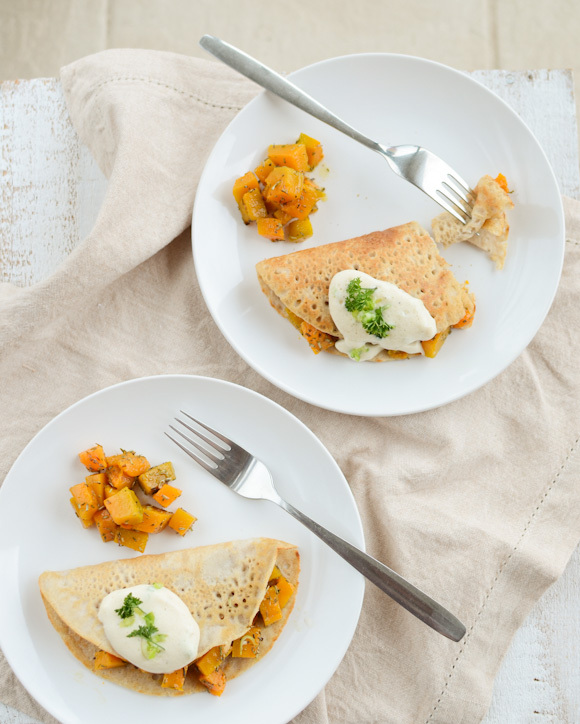 Brush a small frying pan with olive oil and pour a thin layer of the crepe batter on to the pan. Swirl the pan to spread the batter. Cook for a few minutes, then flip over to cook the other side. Continue with the rest of the batter. 4. 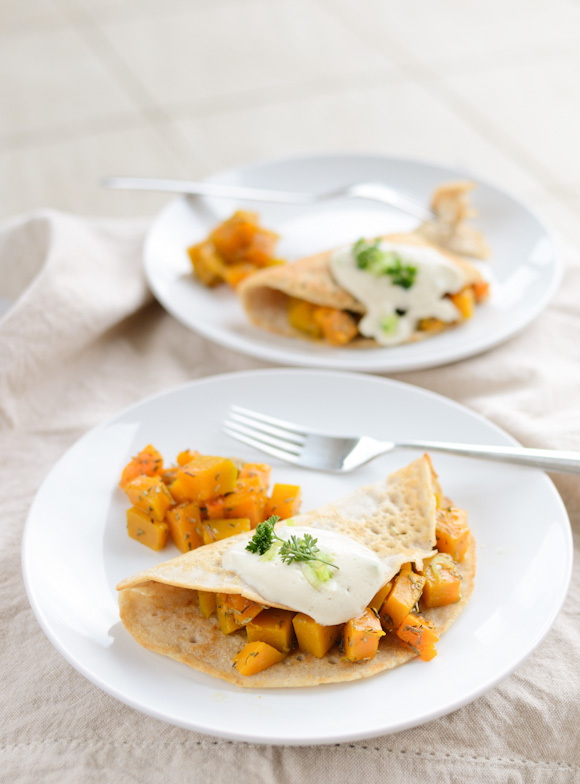 To assemble, fill the crepes with roasted pumpkin, top with tofu mayonnaise and sprinkle with finely chopped chives or spring onion. I LOVE crepes! Just made some last week :) I love that these are a healthier option! I love everything in this post. OHH, farmer's markets, long walks, Candle 79! And those crepes! So lovely and simple. Yum! Crepes are the best and while I'd usually go for a dessert version I wouldn't say no to this. I'm a little curious about the tofu mayo. What role does the yeast play in the mixture? Well there you go! Thanks Maria, will have to look out for it and start experimenting! Thanks! Yes,you could use chickpea or besan flour, even quinoa flour would be great. Hi scandifoodie, this looks AMAZING. However I'm on an anti-candida diet at the moment. The crepes are fine I suppose I could use spelt flour or something, but do you know of any good replacements for the squash there are? Ones without sugar? Mmm, such a great idea! I am on a special diet right now with no eggs, så I will definitely have to try these.. Since I cannot eat potatoes either, I'll substitute the potato flour with arrowroot. And so lovely with the pumpkin.. Unfortunately they're too hard to get right now in Denmark, have to wait until Danish autumn, but will try with yams instead, I think! Yes! If I could I would gif you a big hug:) But I'm dutch and living all the way in Holland, therefore just saying Thank You! I'f just discoverd your blog, and love your recepies. Im vegan and eat glutenfree. Unfutunately most gluten free and vegan recepies have many E-numbers, here in Holland. Trying to avoid those, baking was a challange untill I came across your blog. Just had your crepes, they were dilicious! This looks delicious and beautiful photography! Yay! So happy you liked it Suzie! Thank you so much for your kind words!! I love the recipe and your AMAZING photos.. it's a treat just to look at them.. I'm fairly new to your blog and recently moved in with a vegan. The recipe looks awesome - would definitely give it a shot for my flatmate! 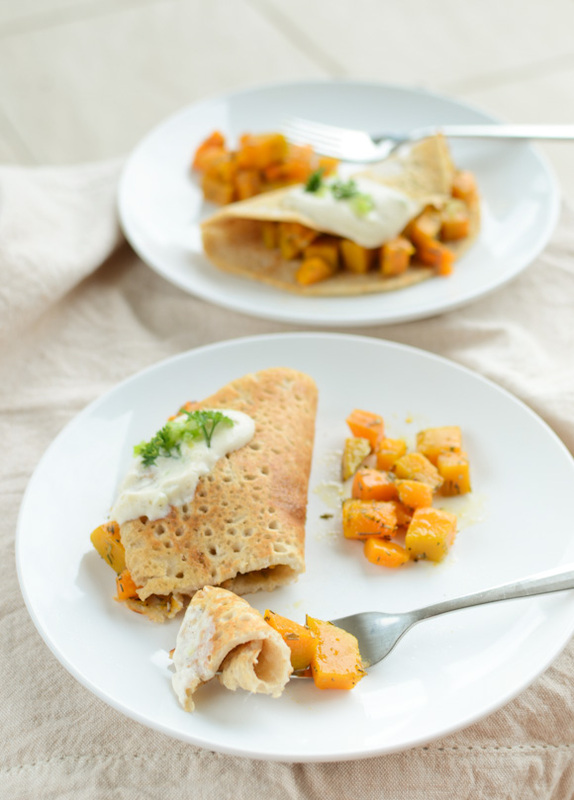 I was looking all over the food-blogosphere for a nice gluten free, egg free crepe recipe. I tried many and let me tell you yours is one of the best! Thank you very much for sharing it!